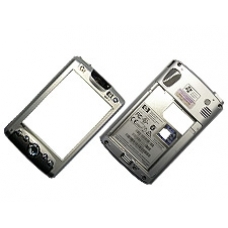 This iPAQ repair service involves the complete replacement the front and rear case assembly. If you have dropped your iPAQ and the front or rear casing is now damaged, this is the repair service for you. All parts used are brand new and factory supplied. iPAQ h6300 series plastic front case. This spare part includes the black speaker surround, power button, four action but.. This is a complete rear case assembly for the iPAQ h6300 range. Brand new rear case spare parts are no longer being manu..